Although we plugged a bunch of outstanding comedy shows on Monday, there is one in particular that needs special attention. 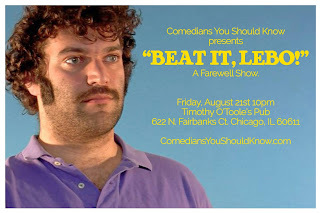 The Farewell Show for Mike Lebovitz should definitely be on every Chicago comedy fan's radar. Officially tiled CYSK presents "BEAT IT, LEBO! ", this mamoth farewell party & comedy show will happen take place this Friday at Timothy O'Toole's Pub - 622 N Fairbanks. The lineup is absolutely bananas. 10 PM (doors at 9:45) This show is SOLD OUT!